S-TL Thermaflex Flexible HVAC Ducts Provide Efficient Duct Work For Residential Dryers, Bathrooms, Cleaning Rooms And Other Ventilation Systems. Thermaflex ducts are non-insulated for low to high pressure heating and cooling systems that do not require insulated ducts. Features a heavy duty fiberglass cloth fabric that is bonded to a corrosion resistant spring steel wire coil for long lasting durability. Ducts will not unravel when cut and have a self-extinguishing inner core that will not support flames. Temperature range is from -20F to 250F. Duct diameters range from 2 to 20 inches. Greenguard certified. Includes 10 Year Limited Warranty. These highly efficient flex ducts feature a core that is bonded to the steel wire coil to support the fiberglass insulation. 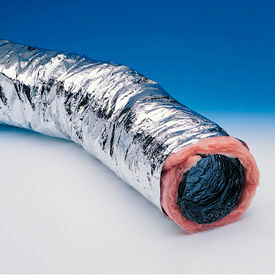 Duct insulation is available in three different R-values for varied thickness: R-4.2, R-6.0 and R-8.0. The acoustically rated, polyethylene inner liner on these HVAC ducts eliminates noise and easily expands. Spiral ducts are mold and mildew resistant. Temperature range is from -20F to 200F and -20F to 250F intermittent. Inner core is self-extinguishing. Ducts measure 4-20 in diameter. Greenguard certified. 10 Year Limited Warranty. 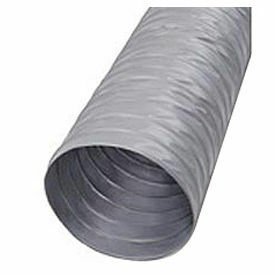 Top-quality, Thermal M-KC HVAC ducts are used for air venting and drying applications. 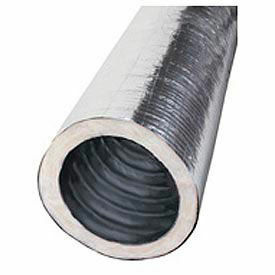 These high-pressure spiral ducts can be used for any low to high pressure heating and cooling systems. Ducts feature a strong woven fiberglass fabric core that is bonded to a steel wire coil to support the thick, air sealing insulation. 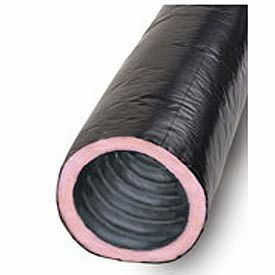 Insulation is available in two different R-values for varied thickness, R-4.2 and R-6.0. These Ducts are self-extinguishing as well as mold and mildew resistant. Core will not unravel when cut. Temperature range is from -20F to 250F. Ducts measure 4-20 in diameter. Greenguard certified. Lifetime Limited Warranty. 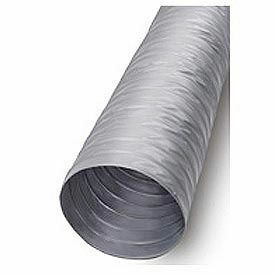 Thermaflex S-LP-10, non-insulated flex ducts are used for low, medium pressure heating and cooling systems where insulated ducts are not required. These HVAC ducts feature a strong woven fiberglass fabric with a flame retardant coating that is bonded to a corrosion resistant steel wire coil for secure air sealing. Spiral ducts will not unravel when cut and have a self-extinguishing inner core that will not support flames. Temperature range is from -20F to 250F. Ducts measure 2-14 in diameter. Greenguard certified. 10 Year Limited Warranty. Thermaflex S-LD, non-insulated flex ducts are an economical alternative where insulated ducts are not required. Spiral ducts are used for low, medium heating and cooling systems. These HVAC ducts feature a reinforced metal film laminate jacket that is bonded to a corrosion resistant steel wire coil for secure air sealing. Spiral ducts will not unravel when cut and have a self-extinguishing inner core that will not support flames. Temperature range is from -20F to 250F. Ducts measure 3-14 in diameter. Greenguard certified. 10 Year Limited Warranty. Highly efficient, Thermaflex G-KM spiral ducts are premium air vessels for low, medium pressure heating and cooling systems. These acoustically rated, HVAC ducts eliminate noise and feature a core that easily expands over fitting. The core is bonded to a steel wire coil to support the thick fiberglass insulation blanket. These air ducts feature a heavy duty polyethylene vapor barrier that provides even airflow and a double air seal. They are self-extinguishing and wont support flames. Temperature range is from -20F to 250F and -20F to 250F intermittent. Ducts have a 3-20 diameter. Greenguard certified. 10 Year Limited Warranty. 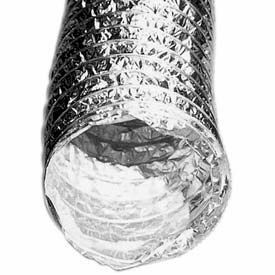 Speedi-Products Aluminum Foil Ducts Are Used For Bathroom Fan Exhaust In Remodeling, New Construction, And Do-It-Yourself Projects. 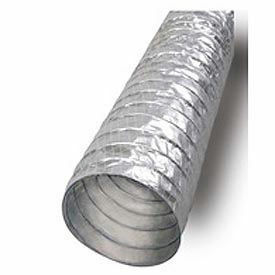 Speedi-Products Aluminum Foil Ducts are made with multi-ply metalized polyester and aluminum polyester laminate with a steel wire support for long lasting durable general purpose venting systems. Foil Duct Vent Kits with Hood are design for use with bathroom fans or other general purpose vents. UL listed and labeled. Plastic hood. Join with approved duct sealant or tape. Use local building code practices. Made in the USA. Insulated Flex Ducts Enhance HVAC Systems Thermal Efficiency For Applications Including Residential, Commercial, Industrial And More. 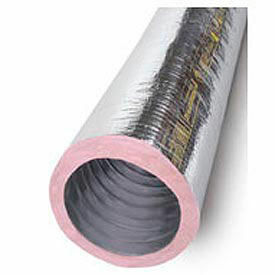 Insulated flex ducts are made from double laminated polyester and a heavy duty silver jacket for long lasting durability. Available duct sizes are 4", 5", 6" and 8". Color finish is Silver. UL181 Listed. Dimensions vary per model.